Do you have dreams of living a more cooperative life? A life in community with people who care and share key values with you? The Cohousing Coaches provide personal and group consultations and technical assistance. We offer perspective, deep knowledge, friendly advice, as well as tools, tours, trainings, and referrals. We help people join and create new cooperative housing communities and, help current ones thrive. Coaches Raines Cohen and Betsy Morris bring over 50 years of combined experience in cooperative culture, community development, and sharing leadership for the common good. We have helped start, lived in, and advised several kinds of cooperative communities separately and together. We are active in the evolution and leadership of the international associations that support this work. In growing networks of members, friends, and partners we connect with thousands of people seeking or living in intentional communities around the world. We are also deeply connected here in the Bay Area to urban and rural pioneers and activists sharing a common intention for a green, just, and sacred world filled with cooperative communities for everyone who seeks. (Find more details below or go to betsymorris.com or raines.com). Most of consultations are in the form of informal conversation with individual or small groups. Our approach is personal, but we draw on many sources to provide a comprehensive perspective. Some of topics we address in workshops and day-long events. Coops, Cohousing, Ecovillages and Beyond - Overview of types, opportunities, international resources, and discussion sharing with seekers or potential founders of intentional community just starting out. Tiny Home Eco-Villages - convergent solutions for sustainable cities and farms in California. Membership Development - Meeting likeminded people; social media and other virtual tools to grow your community; marketing and outreach that really connect! TimeLine Game - we are licensed to lead this 1 to 3 day game to help cohousing groups get organized and off the ground. Governance Systems: 8 Principles of Sustainable Management of the Commons; Formal Consensus methods, and Sociocracy - Proven methods cooperative decision-making and getting the work done in cooperative communities. Strong Suit - framework and exercises for understanding different learning and decision-making styles and growing your community culture. Community economics - financial decisions, resources and business planning for intentional communities now and potential. Lessons and resources from Mondragon, Europe, US, and northern California. Communify! Intentional Community Unconferences - half or full day event where participants propose and convene their own sessions. There is much information on the web, but sometimes a friendly conversation and a personalized road map can really help. Give us a call. We always provide referrals to free resources when possible. individual consultations by phone or in-person to get started. Betsy has a masters and doctorate in City and Regional Planning from UC Berkeley and has been a consultant and director of community and economic development projects, working with California nonprofits, social ventures and public agencies since 1990. She serves on the board of the Fellowship for Intentional Community (ic.org). She created the position of Research Director for Coho/US in 2006, and is a member of the Cohousing Researchers Network, the International Communal Studies Association, and the Global Ecovillages Research Network. She has certificates in Experiential Education/Group Leadership, Nonprofit Management, Fundraising, Affordable Housing Feasiblity, Project Management, and other professional specialties. Raines is organizer of Cohousing California and a dozen regional intentional community networks in California and other parts of the country. He has served as board member and IT consultant for Cohousing Association of the US, and the Fellowship for Intentional Community (FIC) board. He has visited most U.S. cohousing neighborhoods. His interests include: Certified Senior Advisor, and Certified Green Building Professional, and specializes in grassroots/guerilla marketing strategies and using Web effectively. He trained with Al Gore as part of The Climate Project. His background in journalism, computer user group organizing, and the sharing. economy. He is a certified Senior Advisor, and founding member of the Conscious Elders Network. Both have professionally facilitated cohousing group meetings and advised groups on outreach, advised individuals seeking community, and organized regional events featuring national speakers. Both are Senior Cohousing Facilitators trained by Charles Durrett, helping groups with Aging In Community strategies. They live together at Berkeley (CA) Cohousing. 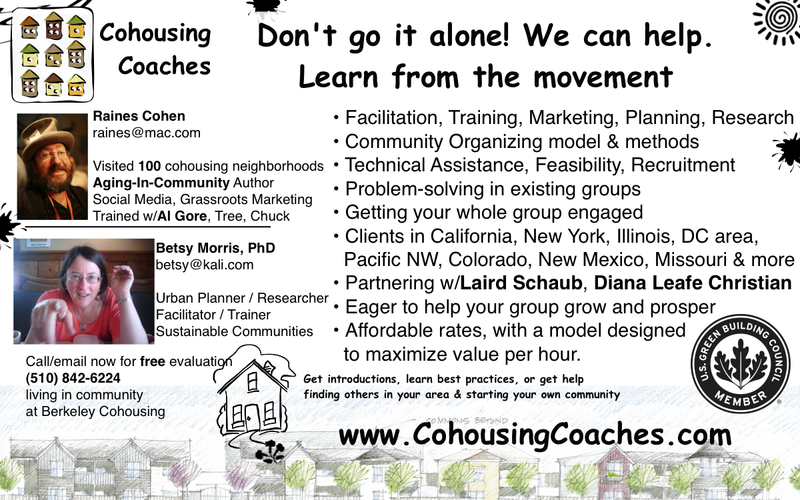 Contact the Cohousing Coaches or call (510) 842-6224 to make your next community connection.